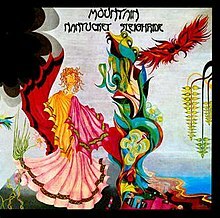 Nantucket Sleighride is the second album by the American hard rock band Mountain. The song and album title is a reference to the experience of being towed along in a boat by a harpooned whale (see Nantucket sleighride). Owen Coffin, to whom the song is dedicated, was a young seaman on the Nantucket whaler Essex, which was rammed and sunk by a sperm whale in 1820. In the aftermath of the wreck, Coffin was shot and eaten by his shipmates. The story of the Essex was recorded by its First Mate Owen Chase, one of eight survivors, in his 1821 Narrative of the Most Extraordinary and Distressing Shipwreck of the Whale-Ship Essex. The instrumental break in the second half of the track uses the melody of the Irish song "Parting Glass". The closing section of "Nantucket Sleighride" was used as the theme to the long-running British political television show Weekend World (1972-1988). A cover version was recorded by British heavy metal band Quartz in 1980. The song "Tired Angels" was dedicated to Jimi Hendrix (James Marshall Hendrix), and "Travellin' In The Dark" was for Pappalardi's mother, Elia. "Taunta (Sammy's Tune)" was named after Pappalardi's pet poodle. The album itself reached number 16 on the Billboard Hot 200 Album Chart in 1971. The bonus tracks on the 2004 edition include the Chuck Berry cover "Roll Over Beethoven" and the original song "Crossroader", which were released as the A- and B-sides of a promotional single in 1971. The latter was later released on Flowers of Evil (1971). Live versions of both tracks appeared on subsequent live releases, such as Mountain Live: The Road Goes Ever On (1972) and Twin Peaks (1974). ^ Chase, Owen (1821). Narrative of the Most Extraordinary and Distressing Shipwreck of the Whale-Ship Essex. New York: W. B. Gilley. OCLC 12217894. templatestyles stripmarker in |title= at position 81 (help) Also in Heffernan, Thomas Farel, Stove by a whale: Owen Chase and the Essex, Middletown, Conn. : Wesleyan University Press ; [New York] : distributed by Columbia University Press, 1981.